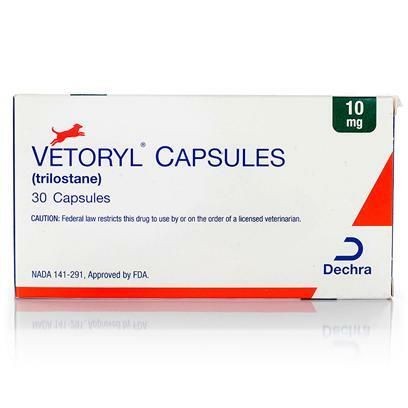 Vetoryl is a treatment for hyperadrenocorticism, otherwise known as Cushings disease in dogs. Trilostane, the main ingredient in Vetoryl, controls the adrenal gland's excess production of cortisol. By regulating cortisol production it will calm the amount of the hormone released into the bloodstream during times of stress which is in flux in dogs with Cushings disease. Rated 5 out of 5 by 26 reviewers. Works in less than a week. very few side effects. My dog has been using trilostane for about 4 months with good results. Easy to order, fast shipping. This med is for dogs with cushings disease. Has changed my dogs treatment completely around! Easy, less expensive than my vet. easy to dispence pop out package is great. Medication has made a huge difference. This drug made my 12 year old dog feel and act like a puppy again. He has no signs of the Cushings Disease since taking this drug.